A couple of months ago, Famitsu had the chance to sit down with Final Fantasy XIV Sound Director Masayoshi Soken to talk about the music in Final Fantasy XIV: Stormblood. The interview was originally released in Dengeki PlayStation Vol. 654 and was later published online. You can read our translation below. Famitsu: I get the impression you used a lot of different techniques for the wide variety of themes for different settings in Stormblood compared to Heavensward. But I could hear the main phrase used throughout the game in different situations, which to me was very moving. Where you consciously aware of this as you composed the music? Soken: I didn’t really do anything different from Heavensward, but the Stormblood melody stood out, so I felt like I had a strong bias towards that. Take Rhalgr’s Reach for example, you can explore it but there’s a point where the player is enveloped in a creepy atmosphere. When you enter the town at that point, the BGM also changes to create an unsettling feeling. I was conscious of that when I arranged the music. I was completely engrossed in the scenario of Stormblood, so I composed the BGM to match it, which really increased the patterns that we used (laughs). Famitsu: Stormblood had more of a Japanese tone, with a wider range of arrangements, so you could say that also made a bigger impression. Soken: In Stormblood we reduced the number of instruments we used. It could be because of that, that the melody comes right to the forefront. We really narrowed down the instruments used in the field music. The music for Yanxia only had two harps and one kokyu [Chinese fiddle]. Speaking of, when I composed the music for Yanxia in Stormblood, this was the first piece that had a very Eastern image to it. Everyone in the team worked together to create that piece, so elements of this piece can be felt throughout all of the tracks. It all feels like…”nostalgic, oriental Japanese, but also Chinese” (laughs). Famitsu: Yanxia, Hingashi and the Azim Steppe are in the same eastern region, but they have very different feelings to them. Soken: I wanted the field themes and colors to be clearly distinct for each region in Stormblood. Of course I also listened carefully when composing the themes to match the quest that was happening in a location, or used what was happened in the scenario, or how long a player was in that field for. Famitsu: I feel like battle themes like Susano’s and Lakshmi’s use a style of music we’ve never heard before. Do you have some kind of personal standard that you use when you compose music like this? Soken: I only think about music that will fit the game, I don’t really have a standard. I suppose I use my own ideas and compose music that inspires me. Famitsu: So, you’re the type of person who composes based on intuition. Soken: Yes, that’s right. Every time I get this “this is it!” feeling, I use that to shape the music. Everything in Stormblood really stands out so I never had to worry about choosing the right instruments. Those instruments help decide the melodies and undulations of the sounds. Among those I get the feeling “this is the kind of melody I can express”. I don’t remember having to worry about it at all… Although that’s just been with Stormblood (laughs). Famitsu: I would have thought that in your line of work you would have accumulated an understanding of what instruments would produce which sounds. Soken: It sure was just like that with “Yanxia will have a kokyu”. There were times when I wanted the melody to use a Mongolian style, so I thought “I need a harp that sounds like a morin khuu, and a kokyu”. Those pieces came right away. Famitsu: By the way, how many instruments do you have in the sound room? Soken: We basically only use music software, so not that many. Famitsu: But you’re still able to create such natural sounding music and sounds. Soken: An orchestra can create all kinds of sounds, which means you don’t notice the details of the individual sounds in the grand scheme of things. But there aren’t that many instruments in Stormblood, so you can get a full taste of the instruments. So, we use the sounds from a source sample from samples sounds and the library. The sound of the kokyu used in Yanxia sounds like it was performed lived but it’s actually created from some amazing arrangements. For example, we have dozens of different samples for the flute. We cut about 1-2 seconds of data for a comma… then we repeat that process over and over again. Famitsu: The NPC playing the kokyu in Azim Steppe seems to be moving to the BGM. Was that intentional? But that actually created a really great sound. Then again, it’s not like I can play the kokyu that well. I had to play each note incredibly carefully, trying to make it sound good together. There’s an editing technique you can use which makes it sound like the notes were played together. The motion team then worked on matching the NPC’s movements with the tune. Famitsu: You must get requests from other teams like the scenario team and battle team. What kind of requests do you get? How does your work progress based on those requests? Soken: We get all kinds of requests for sound, each of them have completely different processes depending on the type of sound they’re after. People are always drawn to the music, but music only makes up 1/5th of the game’s sound. The rest consists of sound effects, environmental sounds, the character’s voices, and the sound engine to move them all in a logical manner. The music’s actually considerably restricted by the contents of the game or the field. The moment someone tells me they want something made for the contents, I make a mock-up. Then once the game is up on screen I can see how the sounds and music works with real gameplay and adjust wherever necessary. The sound effects are made completely differently from the music though. The battle concepts… for example, when the Primals were created the battle department showed us a presentation called “What Are the Primals?”. From that discussion everyone from each department went away and put together a rough plan for where the sounds were needed. Famitsu: So, from that conversation you were able to discuss where and what kind of sounds you needed for mechanics? Soken: We have people who specialize in placing the sounds. There are a lot of times when we go “this needs this kind of sound, when that happens we’ll use this sound, and they combine…” or “when this sounds happens this other sound disappears…”. If we didn’t have programming knowledge we wouldn’t be able to do this. The sounds often overlap, and we have to fit them together like a puzzle, putting about 100-200 sounds together into a single content. The work that goes into the sound effects involves checking the timing for sound effects and what sounds good together. You don’t know how to adjust the sounds if you don’t understand the situation they’re used in. It’s not just a matter of making sounds, you have to create them while imagining how the sounds will be heard. Famitsu: But how do you guess how the sounds will work together when the sounds triggered by players overlap with one another? Soken: That’s a good point. Also, there’s a big difference between a something sounding fainter if there’s distance, but if a sound is needed for a mechanic, they player can hear it no matter where they are. The shriek of the last boss in The Royal City of Rabanastre is a good example. It doesn’t matter where the shriek comes from or what the players are doing, they have to hear it, right? It’s not just a matter of distance, but it can’t be drowned out by the sound of 24 player’s footsteps. So we have to arrange the sounds so that some are more prominent than others. Famitsu: So, it’s like the layers on an image? Soken: It really is like that where we’re layering 256 individual layers on one another (laughs). Also, when the same sounds play for whatever reason, they fight with one another, so we also have to program each one so that one wins over the other. When we have about 100 sounds on the same layer we need to decide which one will come out on top. Famitsu: Do you decide which sounds are going to be the boss from the start? When I consciously listen as I walk through a town or play a scenario, I can tell there are a humungous number of sounds. Soken: Humungous indeed! The audible range of the player’s footsteps are incredibly different from the audible range of a stomping boss monster. We have to arrange each of those individual sound. There are also two steps in the settings for the range of audio you can hear from the loudest sounds to the quietist when the volume is turned all the way down to 0. Sometimes there are even 3 steps. We often have to do really minute setting adjustments which we do while we’re playing the game ourselves. Adjusting even just one sound effect can take quite… no, a huge amount of work. Famitsu: Between composing the music and emulating the final sounds, which takes the most amount of work? Soken: In Heavensward, the sound settings took up more time. But we had a few more staff members for Stormblood, so more time was put into the music. …Although now that I think of it I spent more time working on the arrangement for the album, the Fan Festival, and going abroad. In the end I only had abut 3-4 minutes a day to work on composing music. Famitsu: So Soken, does your work start with preparing the samples for creating the sounds? Soken: The music and sound effects both start that way. I imagine what kind of sounds I’ll need, and pick up the samples I’ll need for those sounds. I then process those materials. Famitsu: Do you also record real life sounds? Like the sound of walking through the grass on Azim Steppe? Soken: We basically created everything so far from sound samples. The flavor of the environmental sounds in Stormblood are different, so even though I’m using the same samples, I’m creating a more realistic feel with them. Famitsu: Speaking of Stormblood, I’m curious about how you arranged how the player hears music and sounds while swimming under water. You mentioned in the past that you used a special synthesizer, but how do you actually create this effect? Soken: To begin with, how the sounds reverberate (echo) in a field or dungeon, has been carefully set to match each area. To put it another way, we get a “prime” simulation for how sounds reverberate, and carefully enter that into the field. So when you go to a particular area you hear the sounds after they’ve been run through the simulation. Which means natural sounds for what’s appearing on screen. However, when it came to underwater scenes, we have to use a special process to make it sound like the sounds are passing through water. On dry land 1 second of sound can only travel about 340 meters. But sound actually travels five time faster in water. So you should be able to hear more sounds under water. But, a human ear can’t ear sound that well under water, so we ended up discussing “how can we best re-create this effect?” and ended up using a special synthesizer. When a player is under water the synthesizer changes the sounds in real time. It’s the same sounds you would hear on land, but when filtered through the synthesizer, sounds like sounds like what you’d hear when you’re under water. Famitsu: Yanxia has a lot of obstacles such as rocky mountains, whereas Azim Steppe is very open… So I imagine how the sounds echo vary depending on the location. Are you also considering how the sounds will reverberate when you’re creating them for a particular place? Soken: Of course we are. It would sound really unnatural if there was nothing there and the sound moved like there was nothing around it. A wide open space doesn’t have many sound effects but that means it’s also an area where you can feel even the slightest breeze. We tried to create that feeling in fields that have nothing in them, where you can easily feel the breeze. We also included a sense of sounds changing as time changes in those open spaces. Famitsu: And when the weather changes. Soken: Of course there are a number of weather patterns which each have their own environmental sounds. I was actually disappointed when I heard we were getting more weather patterns (laughs). I had to make the sound effects for each special weather pattern, such as the Gloom in Mor Dhona. I make environmental sounds for 4.0ch in all directions, but I can’t simply make loops. We arranged them so there are tens of thousands of patterns of random sounds that mix into a sequence. So even if a player spends a whole day in the same location they never hear the same sounds twice. That’s the same no matter what field you’re in. Famitsu: Do you get many requests from the scenario team or background team for sound effects? Soken: We get a lot of requests. We also get requests from the quest and sub-quest teams. Once I know “what does this mob monster need to sound like” I can make the sound. Famitsu: Sometimes you fight in different scenarios such as the sky or space, do you have to arrange different sounds that you normally use for those? Soken: The sounds are completely different when you’re in the sky. Battles like Shinryu’s where the area changes, there’s this sudden uneasy feeling which we’ve programmed to seem in slowly. The areas themselves also don’t have a simple way to create reverberation, so we need to use all kinds of filters. You can come up with all kinds of arrangements once you see you can create different atmospheres with the same resource. Famitsu: Speaking of boss monsters, the bosses in Omega: Deltascape all have their own sound effects, which are vastly different from FFV. Of course the sounds themselves are a lot cleaner than the older ones which creates this uneasy feeling. How did you create these sounds? Soken: The older sounds never used real sounds either so there were a lot of iconic elements. They left a impression on the player. But just like the older melodies, when the old sound effects played they didn’t match with what was on screen now. So we arranged the sound effects to match FFXIV. I had to imagine how would these older sound effects would sound in a modern setting. I was very conscious of remakes and arrangements of past games. Actually, there are some of the original sounds faintly mixed into the modern sounds. So I can’t say I created those sound effects (laughs). And we have a lot of excellent staff who took care of those. Famitsu: In terms of sounds for different mechanics, do have a set system for “this mechanic will always use this sound”? Soken: The sound concepts are classified by ones that sound real and ones with iconic sounds such as “this sound always plays when this happens”. Iconic sounds are ones that are easily recognizable, such as the sound when you lose a fight, or the cue that something is beginning, or the sound when you form a party. So even if the sound isn’t real, an iconic sound is one where you know exactly what’s just happening. However, the people requesting sound effects aren’t conscious of this most of the time. So when we’re playing the game ourselves we often say “this iconic sound will work well here”, and arrange it so that it changes the request slightly. Famitsu: The other day, battle contents designers Nakagawa and Sudo had an interview where they talked about how the sound team changed the proposal for the sound effects for Sephirot’s attack Yesod. (*When this attack is activated a ranged attack focuses on the player and activated after a certain amount of time. Has the nickname “bamboo shoots”.) Does this often happen with sound proposals? 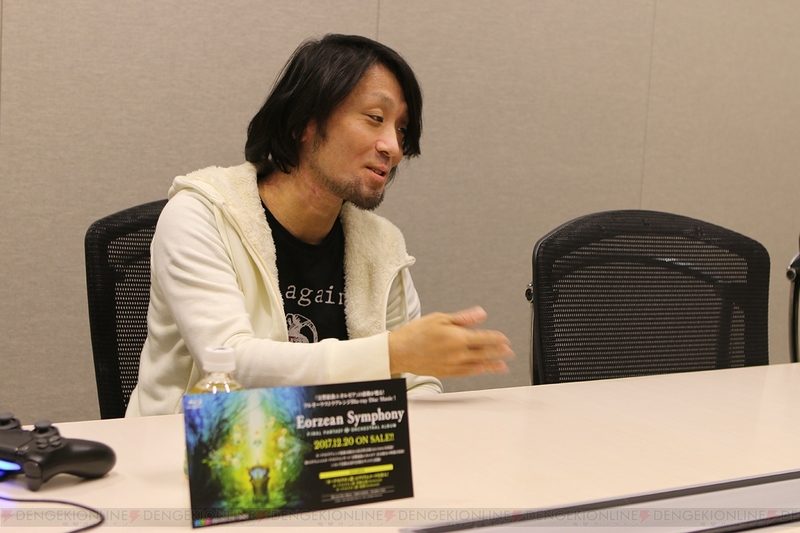 Soken: The sound team often get requests like “make a sound happen here”. Foreshadowing sounds are very important, don’t you think? But to be honest, when we conduct a debugging playthrough we often suggest things like “does this really need a sound here”? Of course, that’s only when it doesn’t have a big impact on the gameplay (laughs). Foreshadowing sounds are very important after all. Famitsu: Now that I think about it, at the beginning of The Binding Coil Of Bahamut there are sounds like Twintania’s dive bomb, which are real life savers in boss fights. The Unending Coil of Bahamut (Ultimate) turned into a boss rush, but are there sound effects which reset for this? Soken: The conditions for activation timing and special abilities are different so we do basic adjustments for those. But there were a lot of people who had done The Binding Coil Of Bahamut in the past, so we were careful not to make them too different from that one. Famitsu: There are an unusually large number of mechanics for The Unending Coil of Bahamut (Ultimate). It must have been really hard to arrange the sounds so one sound doesn’t go off when this other sound goes off, like you were discussing before. Soken: It really was hard… In The Unending Coil of Bahamut battle alone I kept thinking “how many orders do I have to put in? !” Sudo (Kenji) isn’t the type of person who listens to others at all! He should know that our resources have to be divided for each scenario, but he gauges my mood before coming to me with three to four times the normal amount. Then, while he’s still gauging my mood, he asks things like “so, is it done yet?” so I say “well, I guess it is!” (laughs). But that can lead to something interesting results so I always accept those requests. There’s always this fight for a balance between annoying requests and content for the game. At lease with him (laughs). Famitsu: Did you talk with Sudo about how long The Unending Coil of Bahamut (Ultimate) battle would go on for when arranging the BGM? Soken: Sudo, Ishikawa (Main Scenario Writer, Natsuko Ishikawa) and I talked about what kind of music we’d need in different situations. That’s when we discussed that we wanted to use parts of the music from the movie “Flames of Truth”, which people will remember from The Binding Coil Of Bahamut. Famitsu: I have to say the flow between the tracks Twintania -> Nael deus Darnus -> Bahamut -> Last, were very natural and didn’t feel out of place at all. Soken: We made it based on the estimated time it would take someone trying it for the first time. I thought that once a player got used to the fight they would be able to rush through it, so they wouldn’t have time to listen to the music. So I arranged them so they would match the time I assumed player would spends in there. There is also a lot happening in The Unending Coil of Bahamut (Ultimate) so I wanted to make sure the music fit well with what was going on. Famitsu: Could you please tell us about any of the tracks which you particularly liked in patch 4.0 or later? Soken: I think it would have to be “The gods have no eyes for chattel!” (laughs). Famitsu: But that’s dialogue! Although I suppose it did have a strong impact (laughs). Soken: I think the music in the second half of the battle with Shinryu was good too. The stage effects were left to the battle team but it worked really well in the end. Famitsu: So the sound team and other teams with different methods work together. I understand the feeling well when you can work well with another team. Soken: Yes, I get that feeling all the time. Although we mostly communicate what goes in a patch via memos. The people in charge of scenarios always want new music and sounds, but I often argue things like “this is an iconic element so we should incorporate it” or “this fits in with the theme for this section so we don’t need to make anything new”. There are a lot of times when creating something entirely new has a negative effect, so I often cut them completely. Famitsu: I know you’ve been asked this before, but did you ever discuss how you would arrange Neo Exdeath so it keeps these creepy elements of the original? Soken: Yeah. The tempo for that piece is a little slower than the original. Keeping the same tempo made it sound like it was being performed by a Chindoya band [lively street performers], so I had to slow the tempo a little to enhance the player’s experience. I say that but, although I arrange the music I’ve never thought “listen to my music”. I have the mind-set that the music is part of the gaming experience. I’m a person that helps make games, so that’s always been important to me. Famitsu: And finally, do you have a message for the fans who are excited for what will come next? Soken: I have to be careful about what I say about patch 4.2 so I can’t really talk about that but… We’ve had a lot of requests for patch 4.2. Mostly things like “what, no new year patch?” ( ^^; ). We’ve put a lot of content into patch 4.2 though. I’m also really excited for the next Omega: Deltascape!! This is a little egotistical, but I think the next one’s done really well (laughs). There’s so much raid music that I wonder how I managed to arrange it all. But once I open that lid I just think “well there’s no avoiding it”. I hope that everyone who plays it will just go “wooow!”. So look forward to that (laughs). Famitsu: Thank you very much!